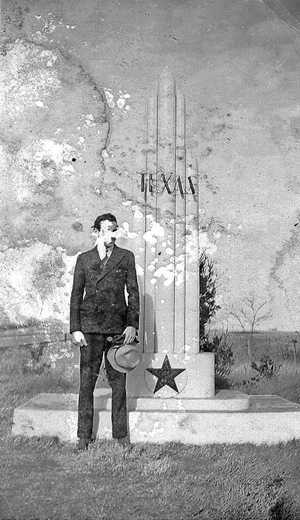 The Case of the Texas Mystery Monument. Attached [is a photo] showing my father (now 92 but with very limited memory) standing in front of a monument. 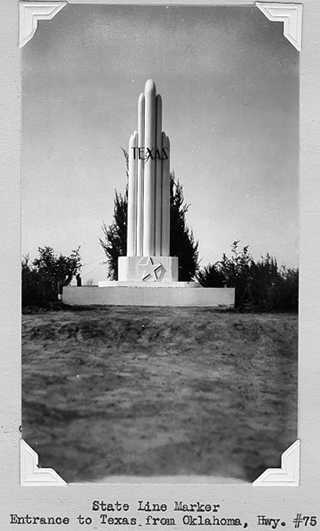 I've been in touch [with] the Texas Historical Commission, but [I was told that] that agency only came into existence in 1953, while this photo would have been taken some time in the 30s. Have you ever seen anything like it in your studies? I'm interested in anything I can learn about it--where it was, is it still there, what did it signify, etc. I know you don't [can't] get into genealogical stuff, but I will admit I'm interested - since knowing about it would help me to know when Dad came to Texas. A fascinating photo. We'll be happy to add it to the forum and see what our readers say. It's a shame the silverfish ate your father's face. Our reluctance with geneaology is only due to people who get deep into extended family and timelines - but we often "get involved" with forgotten cemeteries and family stories. That's really what gets us out of bed in the morning. 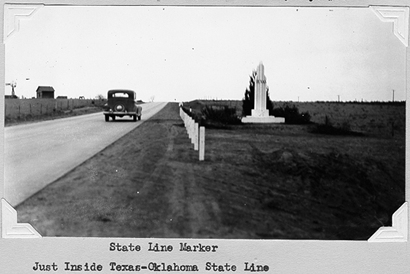 Since it doesn't appear to be a specific marker - it may be a forerunner to the familar Texas silhouette markers at the state line(s). It might even be a prototype that was never used. The streamlined shape would match your father's natty 30's suit. We're glad to hear your father is still with us - reaching 92 is quite an accomplishment - no matter what the 100-year-olds say. We will ask for help from Anne Cook, the photo librarian at TxDoT. She has albums of old photos going back to the 30s - and she's been a great help over the years. If you would want people to contact you directly, we can include your email address - but we always ask first. Sometimes we get immediate responses - and sometimes we don't hear a thing. Our demographics are on our side - since many readers are in their 70s and 80s. It's a wonderful photo. Let us know if you want your email address published. Thanks for the quick response. Yes, you may share my e-mail address, and the original e-mail itself, with anyone you think might help. As far as TxDoT goes, by coincidence, it was also suggested by Teri at "oldphotos@houston.rr.com", I just sent an e-mail to the general mailbox there--however, if you have an address for Anne, I'd love to contact her directly. Subject: Silverfish ate my father's face! Any comments on the attached photo would be appreciated. It almost looks like a photographer's backdrop. Since it doesn't seem to be incident or disaster specific - could it have been a forerunner to the present markers at state lines? A prototype? I wish the silverfish hadn't eaten the face of the subject - but it's an interesting photo just the same. Thanks for your time. Hope you are doing well. Yes, I know this photo. I'm thinking it was tied in to the Centennial of 1936. Let me poke around and I'll get back to you soon. Thank you. That would be wonderful if you had it. Okay, I found a photo of the monument without the gentleman. There is no identifying information attached to the photo, catalog number H-312. And the images filed on either side of it are from VERY different locations H-311 is Pecos County and H-313 is Woodville; so I hesitate to draw any geographic conclusions. I'm asking John Anderson at the Texas State Library and Archives if he has any ideas. We struck out with Anne - but she's checking with _______________at the Texas State Library and Archives. You've got some of the best people in the state working on this. - but don't worry - we still have a chance with our readers when it is published. Anne has proven herself more than once and ________________ is certainly no slouch. 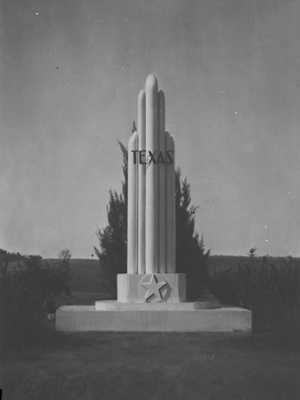 However, since the subject is a monument, Anne has files that the Texas State Library wouldn't have - but on the other hand - the Centennial was a VERY big event. The state erected hundreds of distinctive gray, granite markers if not thousands - and most are still standing. This one, however, is new to me. Although somewhat rare in Texas - Art Deco did make it here. I was thinking it might've been the State Fair - since Fair Park in Dallas has Art-Deco sculptures. Subject: Re: Fw: Silverfish ate my father's face! Actually, I wish I could blame silverfish for the degradation to my father's face, but that occurred as I tried to (gingerly, but obviously not well enough) remove some dirt from that area of the snapshot. No worries about the title, though--I got a laugh out of it! I've attached two photos of a mystery monument. The Photo Library shot, H-312 has no identifying information attached. And the images filed on either side of it are from VERY different locations H-311 is Pecos County H-313 is Woodville, so I hesitate to draw any geographic conclusions. I'm asking John Anderson (photo curator at the Texas State Library and Archives) if he has any ideas. The other photo (along with the query as to details) came from Texas Escapes and was submitted by a www.texasescapes.com reader. Anne -- I'm pretty sure that's the 1936 Centennial state entry sign on Route 66 entering the Panhandle from the east/Oklahoma. I've seen photos of it before, and I'll think about it awhile to remember where. Perhaps in one of the THD District Centennial photo albums that you have a few of. I would say the gentleman in the second photo by the sign is Lyndon Johnson, but the hat's too crumpled. That's certainly a natty suit, anyway. Although captioned as Highway #75, it is better known as Route 66 which has been supplanted by Interstate 40. I'm forwarding this to TxDOT Wheeler County maintenance to see if anyone knows the fate of the marker. It's been a pleasure tracking this one down. Thanks for asking. Richard, Good news! What follows is Anne's letter. I had a feeling it was a state line marker. On Route 66! I hope it prompts your father's memory. The base of it might still be there. I know there's an old jail on the Oklahoma side we've been trying to get - so we might try to get an "epilog" photo should we find ourselves near there. Let me know what you think - we'll still feature it - even though the mystery is now solved. You guys are awesome! This info will definitely help me in tracking my father's movements in his younger years. Interesting, though, I don't see the dark star on the base--just the bare concrete one. Regardless, this is terrific! Thank you so much! And so, as the sun set somewhere west of Fort Worth ("where the west begins") five people went to bed knowing that despite turmoil in the Mid-East, high gas problems and a President that says "Nukular" - they, at least, had done their part in solving the Case of the Texas Mysery Monument.